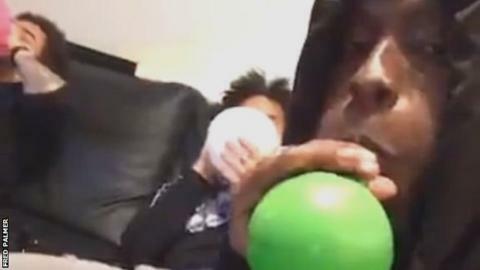 The third Swindon player pictured appearing to inhale nitrous oxide in a live social media video has apologised for "letting down" the League One club. Defender Brandon Ormonde-Ottewill, 20, was suspended along with midfielders Drissa Traore and Jeremy Balmy after allegedly taking the legal high. Traore and Balmy had previously apologised for their behaviour. "I will make sure this experience turns me into something better than I was," Ormonde-Ottewill said on Twitter. All three players missed Swindon's defeat by Bradford City on Saturday after the pictures emerged on Thursday, and the club are investigating into the incident. Swindon are currently 16th in League One, six points above the relegation zone, having failed to win in seven games. "I'd like to take this opportunity to sincerely apologise to you - Swindon fans, my manager, the chairman, the club staff and my team-mates. "I'm sorry I've let you down. These last few days away from the game I love and am committed to, have been tough, but clearly necessary. "I have used this time to reflect and learn. "My error of judgment meant I wasn't available for the game on Saturday. I look forward to the opportunity to make up for my misjudgement and I hope I can do this on the pitch soon. "There's nothing more I want, than to work with my team-mates and return to winning ways. "I love this club and I'm a team player. Now is the time for me to be focused and passionate and I assure you I am. "I will make sure this experience turns me into something better than I was before... both as a person and a player. "I look forward to providing you all with plenty of reasons to restore your faith in me."